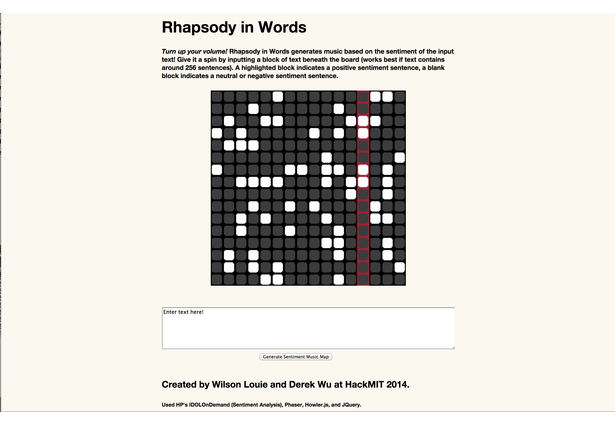 Rhapsody in Words generates music based on the sentiment of the input text! Turn up your volume! Rhapsody in Words generates music based on the sentiment of the input text! Give it a spin by inputting a block of text beneath the board (works best if text contains around 256 sentences). A highlighted block indicates a positive sentiment sentence, a blank block indicates a neutral or negative sentiment sentence. Comments for this submission are closed. View the software in derekwu's portfolio to continue the conversation.